If you live in the South Bay, you won’t have to travel far for a festival. The San Jose-based Cinequest opens Tuesday. The Academy Awards, Balboa, Cerrito, Lark, New Parkway, Rafael, Roxie, Sunday (check theaters for show times). Yes, you can watch Hollywood’s annual ritual of patting itself on the back in the comfort of your own home. You can even ignore it entirely. Or you can go to a movie theater and enjoy the Oscars as a community ritual. But before you do, you should read about my past experiences watching them at the Rafael and the Cerrito. I haven’t decided if I’m going to any of them this year, although the Roxie’s benefit, "where the Little Guy strikes back by yelling stuff at the big screen," sounds interesting. Too Much Johnson, Pacific Film Archive, Monday, 7:00. Did you know that Orson Welles made a silent feature three years before Citizen Kane? In 1938, while directing a revival of a 19th-century stage comedy, Welles decided to film silent sequences to be played before the acts. The result, which Welles never completed and which was lost for decades, has recently been restored. Introduced by Paolo Cherchi Usai, with Judith Rosenberg on piano. A The Past, New Parkway, opens Saturday.This intimate family drama examines a married but long-separated couple. The man returns from far away to manage the divorce. He finds a dangerously dysfunctional family, with a selfish, manipulative, and possibly insane mother, a new boyfriend trying to be a father while trapped in a moral dilemma, and children in desperate need a sympathetic parental figure. The story moves quietly from one crisis to another, without ever feeling forced or melodramatic. Between this new film and A Separation (read my review), I’m ready to declare writer/director Asghar Farhadi our era’s Ozu. A Dallas Buyers Club, Castro, Tuesday; also continuing at the New Parkway. Matthew McConaughey gives the performance of his career as the real-life Ron Woodroof, a Texas good-old-boy diagnosed with AIDS in 1985. He was supposed to die in 30 days, but he did some research, started smuggling pharmaceuticals not approved by the FDA, and kept himself and a whole lot of other people alive for a long time. Yes, this is very much a feel-good movie, but one that acknowledges an inevitable, early death. In the supporting cast, Jared Leto stands out as a dying transvestite. On a double bill at the Castro with Mud, which I haven’t seen. A The Apartment, Pacific Film Archive, Saturday, 8:30. How do you top Some Like It Hot? Billy Wilder found the answer in this far more serious comedy about powerful men exploiting both women and their male underlings. Jack Lemmon gave one of his best performances as a very small cog in the machinery of a giant, New York-based insurance company. In order to gain traction in the rat race, he loans his apartment to company executives—all married men–who use it for private time with their mistresses. With Fred MacMurray as the top exploiter and Shirley MacLane as the woman he exploits. Read my Blu-ray review. Opening night for the series Jokers Wild: American Comedy, 1960–1989. A+ Rear Window, various CineMark Theaters, Sunday and Wednesday. Alfred Hitchcock at his absolute best. 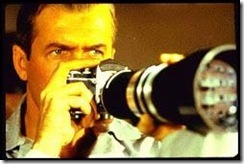 James Stewart is riveting as a news photographer temporarily confined to his apartment and a wheelchair, amusing himself by spying on his neighbors (none of whom he knows) and guessing at the details of their lives. Then he begins to suspect that one of them committed murder. As he and his girlfriend (Grace Kelly) begin to investigate, it slowly dawns on us (but not them) that they’re getting into some pretty dangerous territory. Hitchcock uses this story to examine voyeurism, urban alienation, and the institution of marriage, as well as to treat his audience to a great entertainment. 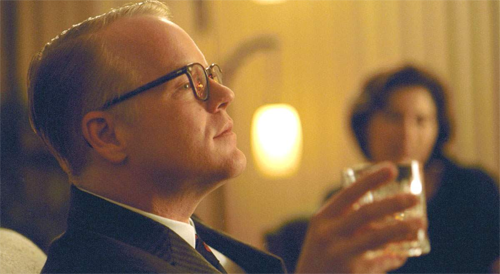 A Philip Seymour Hoffman double bill: Capote & The Master, Castro, Wednesday. I can’t think of a historical figure more challenging for an actor than Truman Capote–you can’t do that voice without sounding like a broad comic parody. Yet Philip Seymour Hoffman makes it work as the film follows Capote’s trail through the research and writing of his last and most-praised book, In Cold Blood. Read my longer comments. In The Master, Hoffman plays a cult leader loosely based on Scientology’s L. Ron Hubbard, as seen through the eyes of an alcoholic drifter (Joaquin Phoenix). For more on the film, see The Master, by a Master, in Masterly 70mm. This is the first of four Wednesday double bills honoring Hoffman. A The Wolf of Wall Street, Castro, Monday. In this based-on-a-true-story epic, his best film since Goodfellas, Martin Scorsese takes us into a glamorous world and makes it look ugly and degenerate. Leonardo DiCaprio brings energy, charisma, recklessness, and charming evil to the lead role of a crooked stockbroker swimming in very profitable larceny. He’s also swimming in drugs and whores. Funny and grotesque, Wolf occasionally tricks you into rooting for DiCaprio’s Jordan Belfort, but not for long. Everything in this fast-paced, three-hour film just fits perfectly. People will talk about the Popeye sequence for years to come. A- Mr. Smith Goes to Washington, Stanford, Saturday and Sunday. 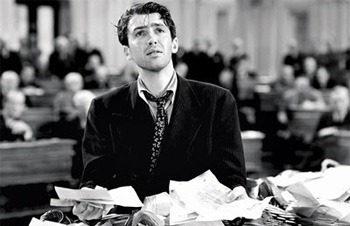 Corrupt political bosses appoint a naive, young idealist (James Stewart) senator because they think he’s stupid. They’re wrong. The second and best film in Frank Capra’s common-man trilogy, Mr. Smith creeks a bit with patriotic corniness, and seems almost as naive as its protagonist. But it has moments–Stewart’s speech about how “history is too important to be left in school books,” for instance–that can still bring a lump to the throat of any leftwing American patriot. And it’s just plain entertaining. On a double bill with American Madness, which I saw a very long time ago and liked pretty well. A+ Casablanca, Cinemark Century 9, Tuesday, 7:30, free. What can I say? You’ve either already seen it or know you should. Let me just add that no one who worked on Casablanca thought they were making a masterpiece; it was just another sausage coming off the Warner assembly line. But somehow, just this once, everything came together perfectly. For more details, see Casablanca: The Accidental Masterpiece. I don’t know if this multi-city TCM-sponsored presentation will be projected off of a DCP or broadcast via satellite. Hope for the superior image quality of DCP. A- The Princess Bride, Clay, Friday, midnight. William Goldman’s enchanting and funny fairy tale dances magically along that thin line between parody and the real thing. The then-young and gorgeous Cary Elwes and Robin Wright make a wonderful set of star-crossed lovers, and Mandy Patinkin has a lot of fun as a revenge-filled swashbuckler. There’s no funnier swordfight anywhere, and who can forget cinema’s greatest acronym, ROUS (rodents of unusual size). On the other hand, some of the big-name cameos really grate on your nerves.